Garvenson held by his father. This little boy died this am- he had a high temperature and seizures. His name was Garvenson and he was born in 2004. He first came to our rehab centre in April of 2005 and he has been coming daily since then. His father adored him and did everything possible to give his son the best life possible. Garvenson attended our school daily and was loved by all. One of the older students, Genet was a great friend to him and called him “ti Joe” . Today Genet was devastated to learn his young friend had died. Genet sat with his head down most of the day and it was heart breaking. As I reflect on Garvenson’s life I am happy to say that in his 10 yrs he was surrounded by love. His father was the most tender loving, patient father one could be. No child could ask for a better father. In our organization, Garvenson found another loving family and we all feel our lives were enriched by this adorable little boy. He inspired us all and the devotion of his father to him was a daily lesson offered to us for free each day- a lesson on how to love unconditionally. A lesson on how true love can call on us to make huge sacrifices, how true love can force us to reach deep inside ourselves and pull out some mighty stuff. Papa Garvenson pulled out some mighty stuff all those years when he made trip after trip to the hospital in an effort to keep his young son alive. When he came every day to school with Garvenson and stayed so he could feed him and take care of him during the school day. 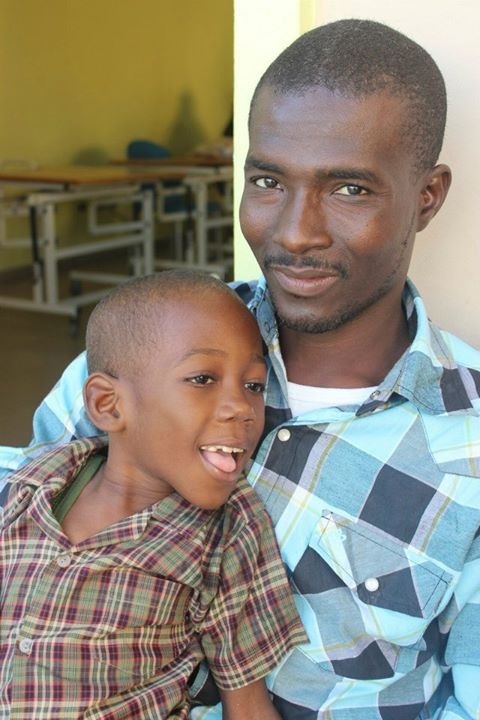 You know in Haiti, not everyone understands that children like Garvenson are just as much a person as an able bodied person. In fact Papa Garvenson was humiliated many times by ignorant people that told him he should not waste his time with this child that would never walk or never talk. Lao Tzu said ” being deeply loved by someone gives you strength, while loving someone deeply gives you courage”. I think that beautifully sums up the love between Garvenson and his Dad. I give thanks to God for this beautiful boy we were honored to know and love, honored to have in our centre, in our school, in our hearts. I give thanks to God for his grieving Father – his love for his son was an unbelievable testimony to the beauty of unconditional love. I give thanks to God for his heartbroken mother who had her only son taken from her at the tender age of 10 years. Thanks to the organization I work for NPH- thanks to NPH we were able to give Garvenson a beautiful school environment and a loving second family. We believe Garvenson is gone now to enjoy eternal life in a body free from limitations. “May The Lord open to him the gates of paradise, that he may return to that homeland, where there is no death, where eternal joy endures. May the angels lead you into paradise.” Garvenson. We miss you already!